Cisplatin is part of the chemotherapy treatment programs for many of the most common types of cancer. This important drug has now been shown to play an unexpected role in blocking one of the pathways most commonly involved in driving the growth of cancers, according to a recent study by researchers at the San Diego Supercomputer Center (SDSC) as well as the university’s Moores Cancer Center and Department of Neurosciences. Uncovering the mechanism by which the drug cisplatin inhibits this pathway has provided insights into how cisplatin might be combined with other drugs that inhibit this pathway to improve patient care, according to the study, published online in the journal Oncotarget. Researchers have shown for the first time that cisplatin can inhibit MEK1/2 (mitogen-activated protein kinase), an important enzyme in the communication pathway that transmits signals from the cell surface to the interior of the tumor cells. The driving force of important oncogenes such as mutant forms of KRAS and BRAF must pass through MEK1/2. Thus, cisplatin may be able to blunt the effect of these oncogenes. The study builds on other recent studies in the anti-cancer field that identified MEK1/2 as dependent on copper to initiate its activity. Cisplatin, which contains platinum atoms, is known to be able to interact with some types of copper-binding proteins. The study and the models developed may also help answer long-standing questions about the efficacy of cisplatin. For example, why it is successful when first used to treat ovarian cancer but much less effective if cancer reappears later. “We theorized that cisplatin might be able to bind in a therapeutic way with MEK1/2,” said Igor F. Tsigelny, a research professor with SDSC, Moores Cancer Center, and the Department of Neurosciences. The study design called upon resources and researchers in biomedical sciences, molecular modeling, quantum chemistry, and supercomputing. The lead author is Stephen B. Howell, UC San Diego Distinguished Professor of Medicine. Both in vitro and whole-cell studies, conducted by Tetsu Yamamoto, a postdoctoral fellow at the Moores Cancer Center, showed that cisplatin inhibited MEK1/2 activity and interacted in a complex manner with copper to simultaneously stabilize the protein. 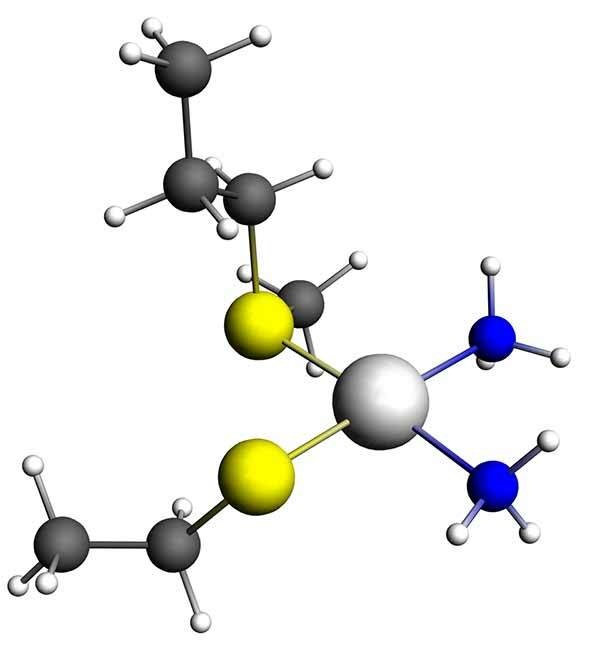 The ADF (Amsterdam Density Functional) software was used to perform highly accurate simulations and predict chemical structure and reactivity. Such simulations are computationally demanding. “Our hope is that these results lead to ways to modify cisplatin so that it does an even better job of inhibiting MEK1/2,” said Tsigelny.